This post is a follow up on my series about GSM/GPRS module Neoway M590. First post of the series concerned some basic module usage scenarios with Arduino like sending/receiving SMS, detecting a phone call and even using GPRS network, the second post was a more practical example of automated garage heater that can be controlled with SMS messages. 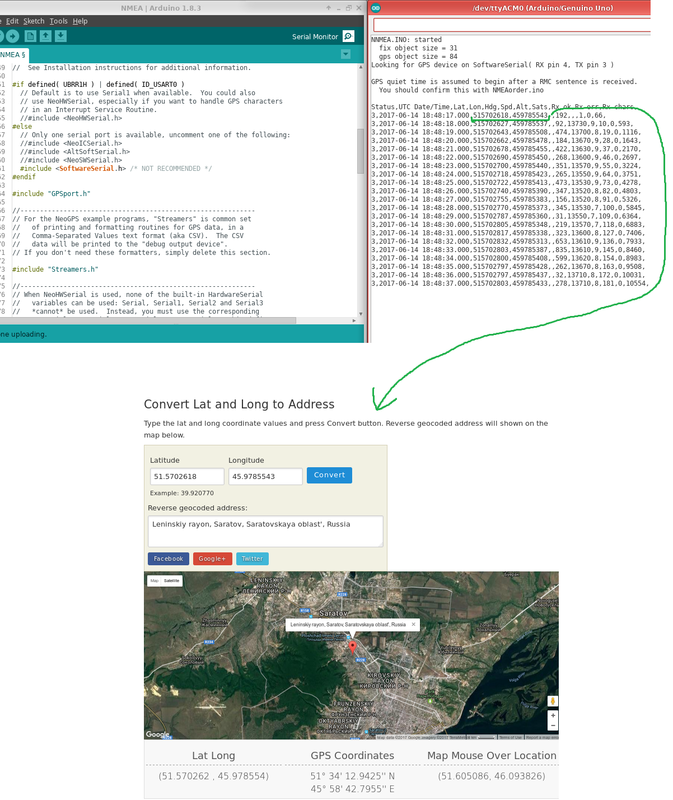 This time I'll demonstrate a more sophisticated example of using this module - making a GPS tracker that sends its location to owner via SMS. We'll have to explore both GSM and GPS modules' power-saving settings to ensure long battery life of our resulting device. This two-part tutorial will also complement the first tutorial I wrote up with more detailed Neoway M590 assembly and startup guidelines. Evidently, you'll need both Neoway M590 GSM/GPRS module and ublox NEO-6 GPS module. The former is usually conveniently sold as a dirt cheap assemble-it-yourself kit on Aliexpress and Taobao (try this kit similar to mine with a wide assortment of connectors.. The one I bought is already 5.5 USD for some inscrutable reasons: link). The latter can be procured as a ready-made PCB complete with a huge rectangular ceramic antenna (here's the link). For the GPS logger iself we'll use the ol' trusty ATMega 328P. Actually, I happened to buy it as a set of IC itself, DIP socket, 7805 voltage regulator, electrolytic capacitors and 16MHz crystal with 22pF capacitors. Not all of that will come in handy, but hey, it was 99 cents! Can't find the same kit now, but this will do great too. The infamous ATMega328p that we all know as a heart of Arduino Uno. 8MHz crystal resonator in the middle. 8MHz crystal resonator. Sadly, my kit didn't include this, and I had to pluck it out of some unfortunate piece of hardware I had lying around. 8.000 printed on top clearly marks this 8Mhz crystal. TP4056 (datasheet) based charger. Can be bought cheaply and in great numbers on Aliexpress and the likes. 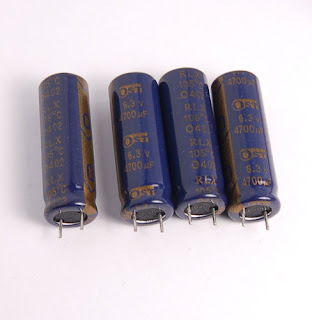 Assorted capacitors. Specifically, beside your run-of-the-mill electrolytic and ceramic caps, you'll need some large capacitance caps that can be found in charge pump circuits on motherboards. Optionally, to test each piece of hardware before assembling the device you'll need: an Arduino, some male and female jumper wires (don't know why I included a breadboard in this picture, but it might prove useful to you). That should be enough. Let's get started then? Not much for such an advanced(ish) device. Soldering those is pretty straightforward, although there's still more than one way one could mess this up. Pin header, resistors (small black rectangular ones with numerals on them) and ceramic capacitors (small yellow ones) are non-polar, meaning you can solder them any way 'round. My kit lacked one ceramic capacitor, you can solder any other salvaged SMD ceramic cap in its place. Tantalum capacitor and LED's have to be soldered in a particular orientation to work. You can tell their polarity (and thus, the way you have to solder them) from markings on their body. Putting all the rest together should be easy. GSM module has a circle on silkscreen, denoting pin 1. You can look up module's pinout in Neoway M590 Hardware design manual . SIM card slot's silkscreen also clearly indicates how it should be placed with a triangular notch. There's only one thing missing now. M590 hardware design manual mentions that it can draw high peak current from its power source, hence you need a beefy capacitor to store energy and smooth out those surges of current consumption to reduce the continuous current output requirements of your power source. The kit I've bought came with a measly 220uF capacitor, and that is only good for the power source that can supply an approximate 0.8A of current! Now, let's upload the code that checks if Neoway M590 module responds to AT commands. For that, use Echo sketch that comes with AltSoftSerial library modified so that it sets 115200 baud rate for altSerial (see screenshot above). After powering up M590, if it's LED doesn't start blinking, you'll have to short the module's ON/OFF and GND pins for at least 0.5 seconds. Once it starts blinking, you should see MODEM:STARTUP in Serial monitor. Try to type AT and send it with trailing CRLF to test communication both ways. The module should send OK back. From my previous Neoway tutorial I learned that though the default baud rate of M590 module should be 115200, in reality the modules that vendors ship sometimes bear the signs of being used before and are set up for another baud rate. To simplify the matter of finding the right baud rate, I wrote a sketch that automatically determines your module's speed. Not a lot to assemble here. Just snap the module's antenna connector in place and solder jumper wires to its 4 pins (Vcc, GND, RX, TX). Alternatively, don't be a caveman like me and do it properly - solder a pin header to module and connect jump wires to it... I also soldered a small capacitor to Vcc and GND for stability. 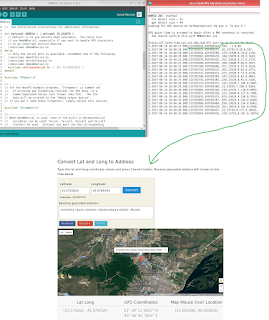 Get yourself some GPS decoding library like this one -> NeoGPS. It is extremely configurable and can be set up to use AltSoftSerial, NeoSWSerial or even the nasty SoftwareSerial libraries for software serial connection to GPS module, along with hardware serial ports found on Leonardo, Mega and such. NeoGPS installation manual on GinHub can be really helpful. Although it strongly advises against using SoftwareSerial, it will do for testing purposes. GPS modules usually need some time (5 to 15 minutes in remote areas) to start up and get a fix from satellites. And once it does get a fix, it will start blinking an on-board LED twice a second. Here's the link to PART 2, where we are going to proceed to design the schematic and build the device. Good to know my post's managed to help a fellow engineer out! Hi, are there any specific pins for the GPS Module with an Arduino mega? I see the gsm is on 46,48. So you suggest running the gps through the hardware serial ports? OK. I have another question about the 4700uf capacitor. When soldering can you solder it to any side of the LED? >I have another question about the 4700uf capacitor. When soldering can you solder it to any side of the LED? 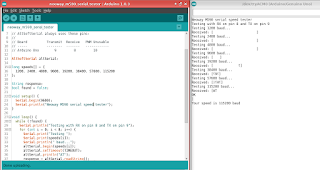 Arduino: 1.8.5 (Mac OS X), Board: "Arduino Pro or Pro Mini, ATmega328P (3.3V, 8 MHz)"
>You'll need to additionally install LowPower library. and there's the link to the library. You can also install it via Library Manager in Arduino IDE. Sorry just saw that after a posted last, I will try the first code first without the low power and then try that second. I noticed that in your video the tracking sends back the gps coordinates after you call, does it also return the gps coordinates if you send an sms? 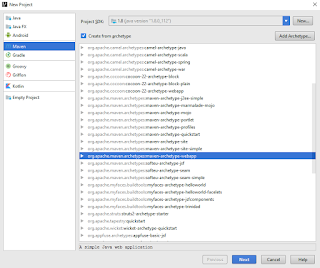 Just a quick question, when you are doing the final construction with the atmega do you have to specify in the program which pin you are connecting to on the atmega? The same way you have to state software serial etc for when testing with Arduino. I think I get what you mean. There's a helpful picture with physical pin to arduino pin mapping for ATMega328P in the beginning of the second post. Yes, so for example I see your pins for your gsm are d8 and d9 and for gps d0 and d1 on the chip, do you have to define this in the code? I am wondering if I need to edit the program to accommodate this if you know what I mean. You don't have to define the gps and gsm pins here? // Put to sleep pin. I think I now understand, I see you are using pins 2 3 for gsm and the altsoftserial library used pins 8 9 already for you so you don't need to define them in your code. Will I need to define them as I am using different pins? Sorry for the belated reply, Firhill! GPS pins are configured in library headers instead of the sketch itself. To configure those pins, refer to the library manual or just take a look at GPSport.h file as it's extensively commented and you will figure it out. And yes, you're correct, AltSoftSerial library uses pins 8 and 9 so I didn't have to define them as well. As for configurability of those pins, I'm not sure if you can do that. Using pins 8 and 9 is kind of the point of this library because those pins are connected to AVR's timer so most of reading/writing is done in hardware without using up precious CPU time.